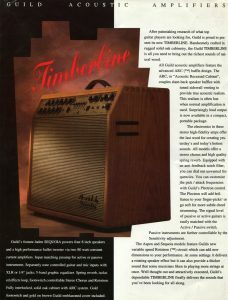 Around 1992 or so, Guild introduced the Timberline series of acoustic guitar amplifiers and only made them for a couple of years. 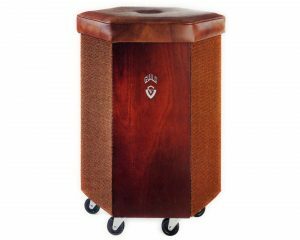 Named after various trees and all but one made out of luxurious solid oak, these amps are quite eye-catching in the same way that hardwood encased cane-grill Mesa Boogies are. These are very classy looking amps and comments on various guitar forums often include statements like “this is the prettiest amp I’ve ever seen.” Well, maybe that’s not often said about the footstool shaped G1000 shown, but the rest get a lot of cosmetic praise. Sadly, there is very little information about these amps out there and almost every forum post I see about them contains people looking for more information, so I took what I’ve learned and put it together into this article. There were five models that I found documented. The G300 Tamarack is the smallest of the series followed by the G600 (and G600D) Aspen, the G700 Sequioa, and the innovative G1000 which does not have an associated arboreal moniker, likely since it looks like a footstool (more on that later). There is an additional model named simply the G-500 that is also covered below. 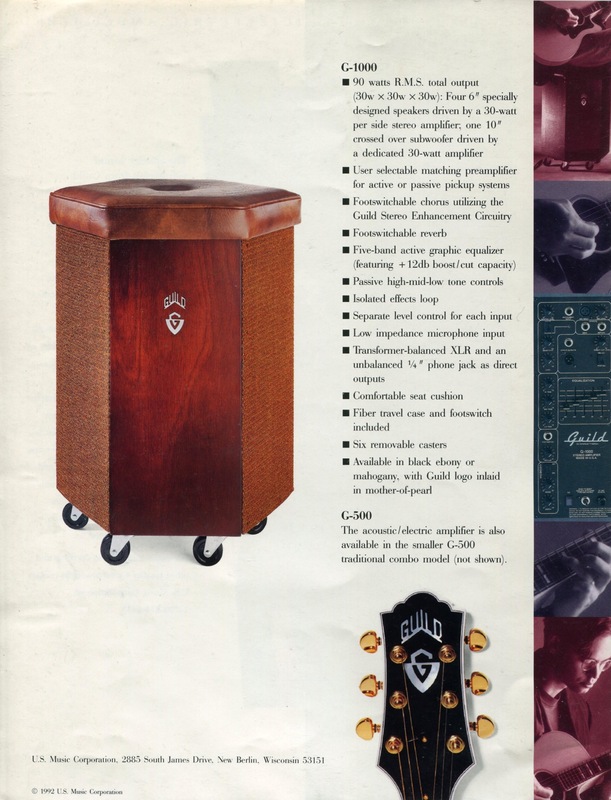 All of these amps were designed by Randall for Guild (both US Music companies at the time). They are all stereo with completely separate power amps and all originally came with nice covers so if you’re buying one without the cover try to negotiate a better deal. Here’s a quick overview of them all including the manuals and schematics when I could find them. Note that some of these are very old scans, sometimes of hand-written documents, so there’s not much I can do about the quality. Still, they exist for which I would like to give a hearty thank you to Randall! The G300 Tamarack is about the size of a normal amplifier head and feels like it weighs about the same. 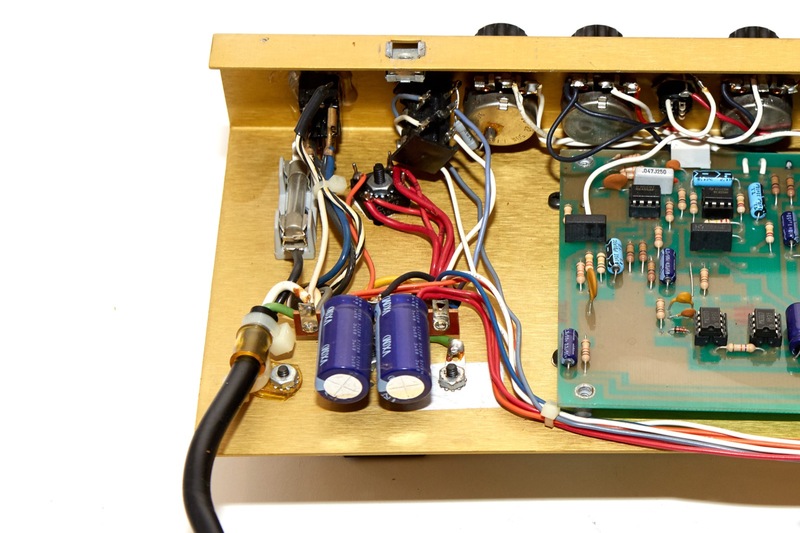 This amp has two 8″ speakers and a single Piezo tweeter. Given its small size and weight, this amp is perfectly sized for a small coffee shop or anywhere that you need a bit of amplification and/or chorus and reverb without hauling in the big rigs. This amp includes active/passive guitar input support, a full active tone stack (treble, middle, bass) with the addition of a Plectron setting that I’ll cover in a bit, a notch filter, a digital chorus and a real spring reverb, a master volume, and finally a headphone jack. The G500 is a bit different than the others on the list. 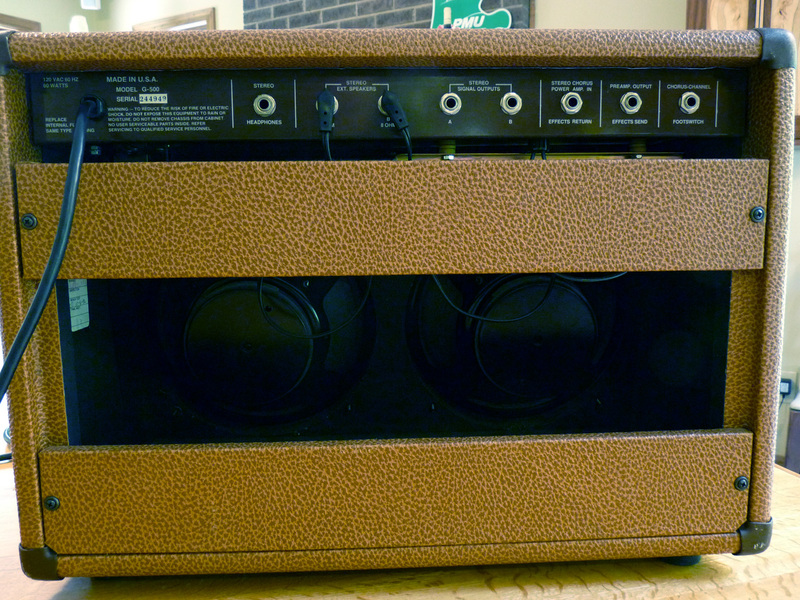 First, it looks more like a regular combo amp and is one of the only amps on the list without the gold G-shield knobs. The only references I could find to this amp were here (source of the 2nd pic) and here. Thanks to Acorn House of Let’s Talk Guild for letting me share his pics. Note that these two amps, though both G500s, look very different. Acorn House’s version has a black face plate and a tolex-covered cabinet while the one from IgorAmp has a gold face place and an oak cabinet. Acorn House reports that the wood in his example does not feel like oak and may likely be some sort of laminate (plywood). 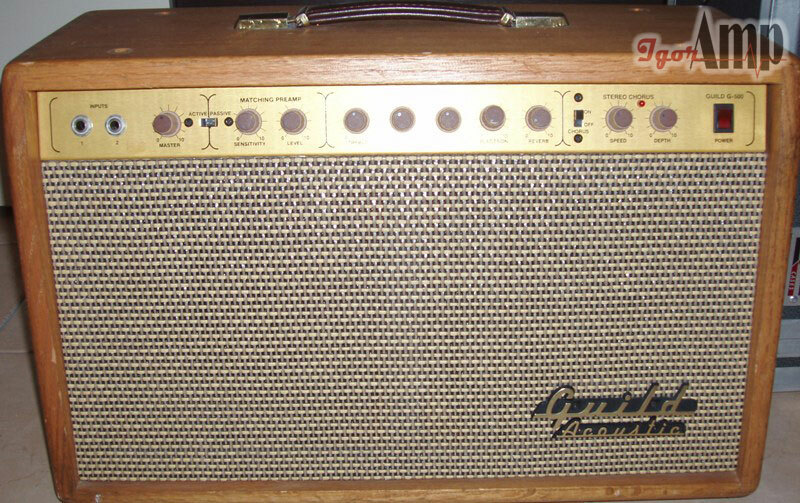 Both examples appear to have the same grill used on the other Timberline combos, but the controls are slightly different and the small beige knobs give it a very different look. The catalog describes the G500 with this odd blurb: “The acoustic/electric amplifier is also available in the smaller G-500 traditional combo model”, though it does not include a picture. That’s it. 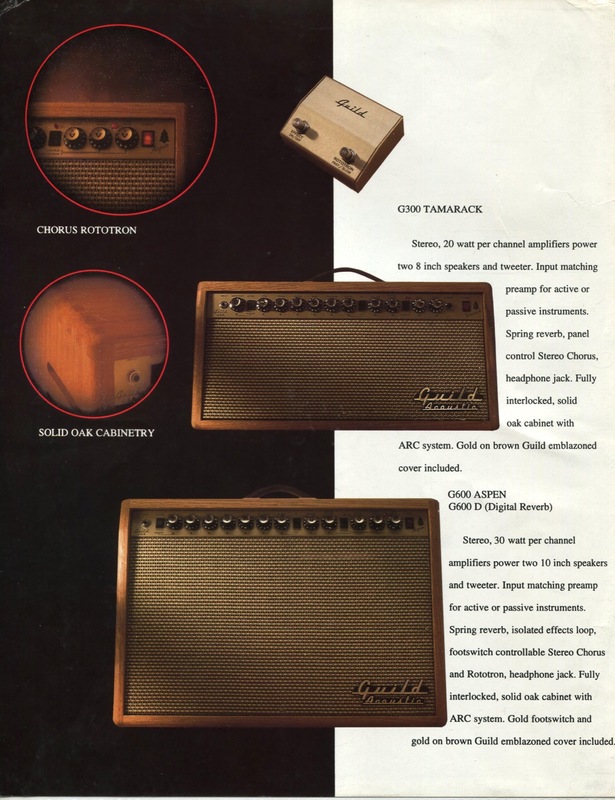 The only two sets of pictures I was able to find show the amp with two different designs. 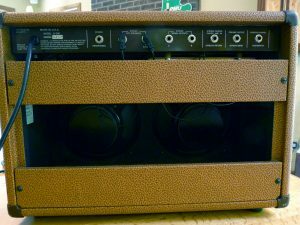 The first has a tolex cabinet with a black face while the second shows an oak cabinet and gold faceplate like the other amps in the series. At first glance the G500 appears to be a Tamarack in a larger case with bigger speakers and more connectivity options. For example it has all of the same controls as the Tamarack, though they are laid out differently. Where the Tamarack has no connections on the back, the G500 has the following: Stereo headphones, external speakers (x2) at 8 Ω each, A/B stereo signal out, effects send/return, and a chorus-channel footswitch jack. The G500 has two inputs on the front where the Tamarack and even the Aspen have only one. There is still an active/passive switch with the same controls, but the master volume is in a different spot. The tone stack has the same knobs including the Plectron (a high-frequency adjustment to help dial out pick attack). 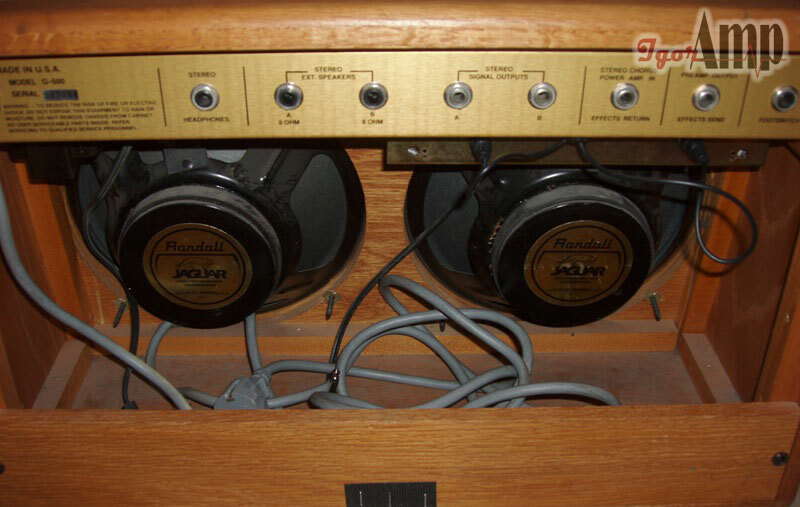 In the pics on the IgorAmp site, two Randall Jaguar speakers are shown, but on Acorn House’s pics there are no labels. 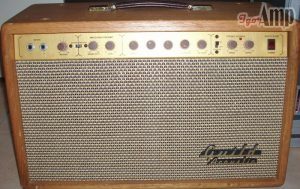 Note that this amp does not have the angled speaker baffles like the others in the series and does not have a tweeter (confirmed by Acorn House). The speakers are 10″ 8Ω and given the data at hand, this really appears to be a regular guitar amp cabinet and speakers with a solid state acoustic amplifier in it. I have been unable to source a schematic for the G500, but the IgorAmp site did post some gut pics. 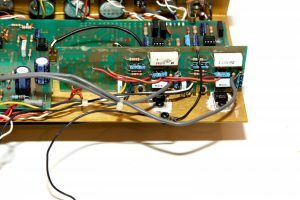 The board in this amp is much smaller than the one in my G300 Tamarack, but without being able to examine it in detail, there’s not much more I can say about it. I’d love to get my hands on one in order to take it apart so if you ever see one for sale or have one that you’d like to sell please do let me know. The G600 Aspen is sized more like a traditional combo amp and sports two 10″ speakers and the same piezo tweeter. 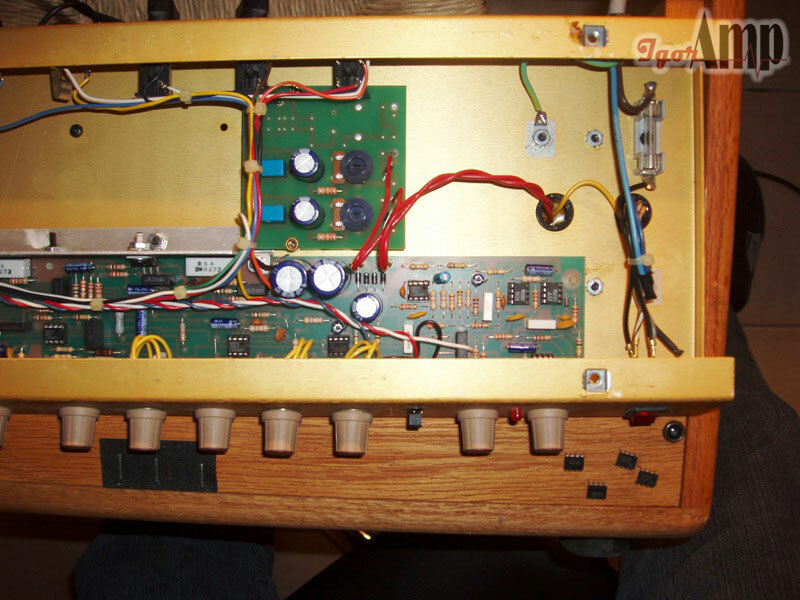 This amp has all the features of the G300 Tamarack but also has a “Rototron” which supposed to simulate an rotating speaker as well as a host of additional connection options on the back of the amp including a jack for a dual foot-switch (Chorus and Rototron – foot-switch included), 1/4″ jacks for both speakers (The Tamarack’s speakers are direct-wired), signal out for both channels, a headphone jack (this is on the front of the Tamarack, but that spot is taken by the Rototron knob on the Aspen), and the return/send jacks for an effects loop. If you happen across a G600D, this is the same amp but with digital reverb instead of a reverb tank. I’ve not seen or heard one of these, but my suspicion is that digital reverb wasn’t quite ready for prime time in 1992. If you have one please leave a comment as I’d love to know more. The G700 Sequioa is the biggest of the combo amps which is why it’s named after the biggest tree. Well, i assume that’s why, but it stands to reason. Still, the G1000 kind of looks like the trunk of a Sequoia so I’m not sure why they didn’t go that route and call this one the Redwood or something. 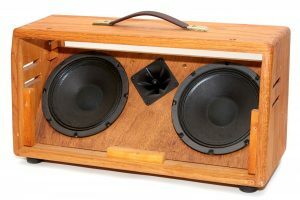 Anyway, the G700 has all the features of the Tamarack and the Aspen but also includes four 8″ speakers and a single piezo tweeter putting out 80 watts from dual constant current amplifiers. A constant current amplifier is one that will keep the current constant (duh) even when pushed. This prevents things like the sag you hear in old tube amps because you don’t want that when amplifying an acoustic guitar. The Sequioa has the effects loop jacks on the front, and in addition to all the features of the lower models, has two complete input stages, one for low impedance (low-Z) and one for high impedance (high-Z). The low-Z stage has an XLR input vs. the 1/4″ phone jack on the high-Z stage. The low-Z stage also has a direct-out with both a 1/4″ phone jack and an XLR connection, all on the front panel. The low-Z input is advertised as being for microphones making this your all-in-on gigging machine. There is also an XLR line-level out for connection to mixing consoles or slave amps. 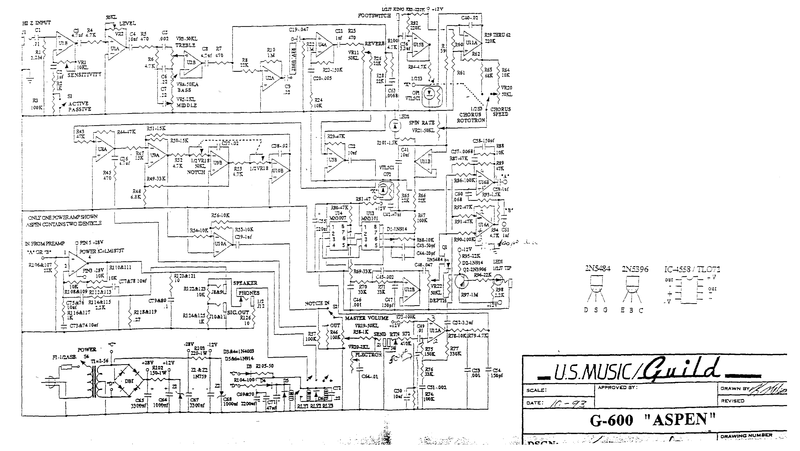 Note that both of these input stages have their own complete set of active tone controls. In addition to those two sets of tone controls, the G700 Sequioa has a 5-band graphical EQ (also active) on the front with five sliders for 100 Hz, 400 Hz, 800 Hz, 2 kHz, and 4 kHz frequencies. I joke that the the G1000 looks like a footstool because it does. To be fair, what it looks like is a stool with a nice padded seat because it was designed for the guitarist to sit on it while playing which is actually a really neat idea. If you’ve ever played in a coffee shop then you know how little space you get to set up, and being able to sit on your amp in style with a cushioned seat to boot seems like damn clever engineering to me. Sadly I think the fact that it looks goofy as hell may have kept this from being a big win for Guild. This amp is 90 watts but instead of being just stereo like the others, this one is actually 30w x 30w x 30w where the first two channels are powering four 6″ speakers and the third channel being a a dedicated 10″ crossed-over woofer. Thanks to Kurt over at The Guilds of Grot for the excellent catalog scans. If you haven’t checked out Grot’s Guilds, head on over and take a look at a Guild collection that makes me insanely jealous. He even has two of these Timberline amps! 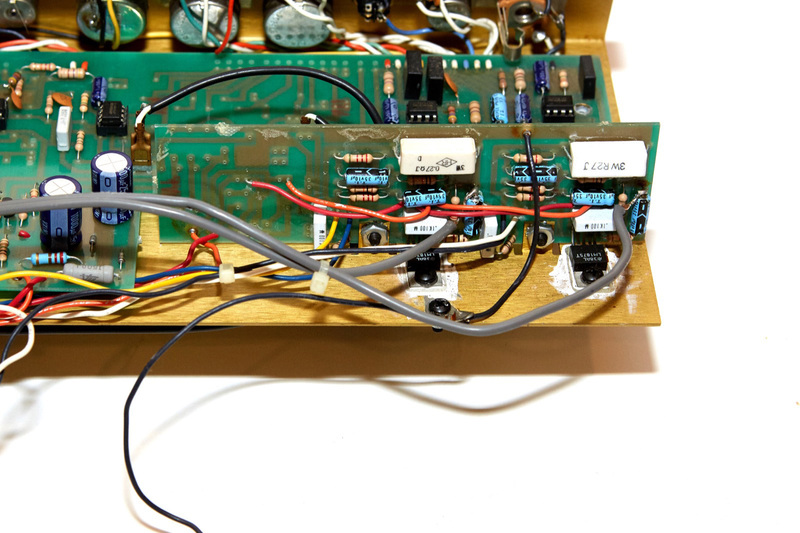 Interestingly, the tone controls on this amp are passive while the graphical EQ is active. 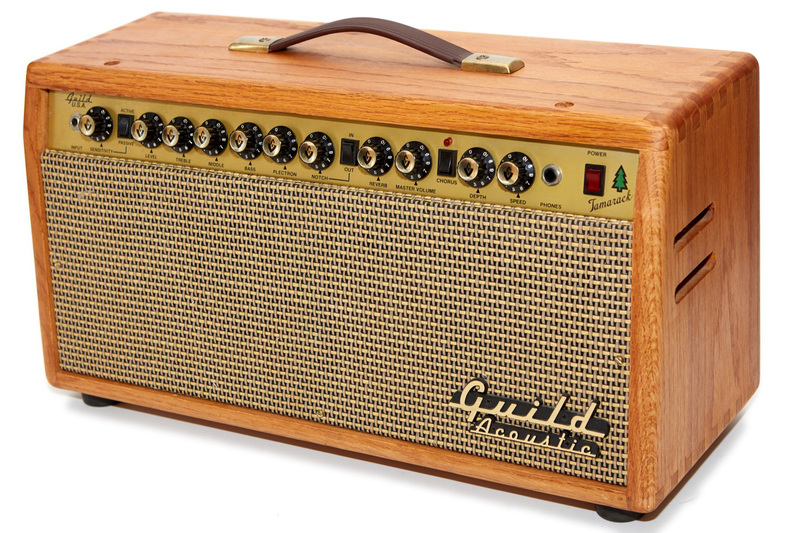 This is also one of the only amps in the series that does not have Guild G-shield knobs (the G500 being the other) and I must point out that I have no idea if this amp is made from oak, plywood, or plastic. Here is a cool article about the G1000 to tide you over until I can get my hands on one. 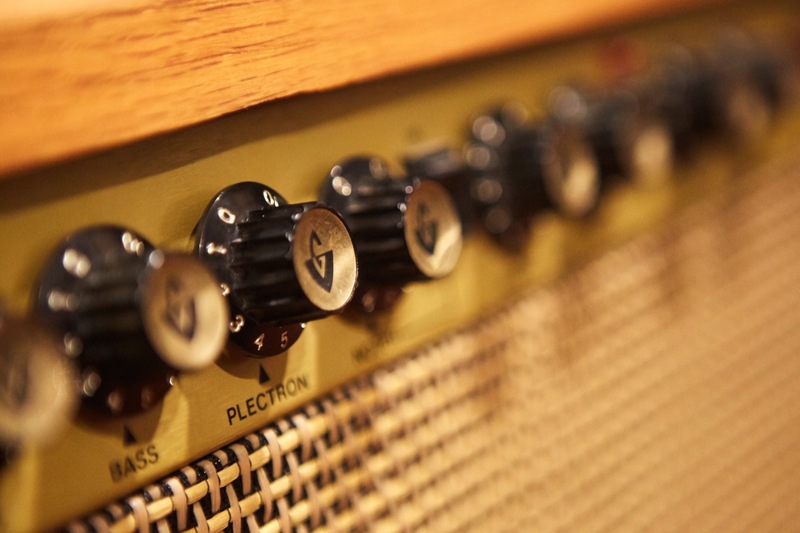 These are very cool amps, but there are some things to watch for if you buy one. The knobs are Guild G-shield knobs in gold on all but the G500 and G1000 models. As of 2017, Guild does not sell any guitars with these knobs so as a result they don’t sell the gold knobs in their store. That means if you need to replace one (or four) you’ll need to buy them used and they often command prices upwards of $20 a piece. Usually the knobs themselves don’t fail, but the gold insert falls out which just looks terrible. I’ve joked that I could buy one of these amps, sell off all the knobs, still have an amp and make money in the process. It’s funny because it’s true. The speakers in most of these amps were made by Eminence for Randall and according to my email conversations with Eminence, there are no currently made direct replacements available, at least for the models I’ve had in-hand. Additionally, the Motorolla piezo tweeter in most of these amps is no longer made, though CTS bought the patents and later sold them to Piezo Source who still makes them. Are they as good, worse or better? I have no idea, but you may still be able to source the original Motorola units on eBay since they were very popular for a time. Just be careful because there are some cheap knock-offs out there. 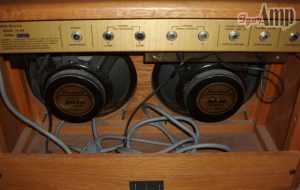 I have read reports that some of the electrical components in these amps are no longer made. 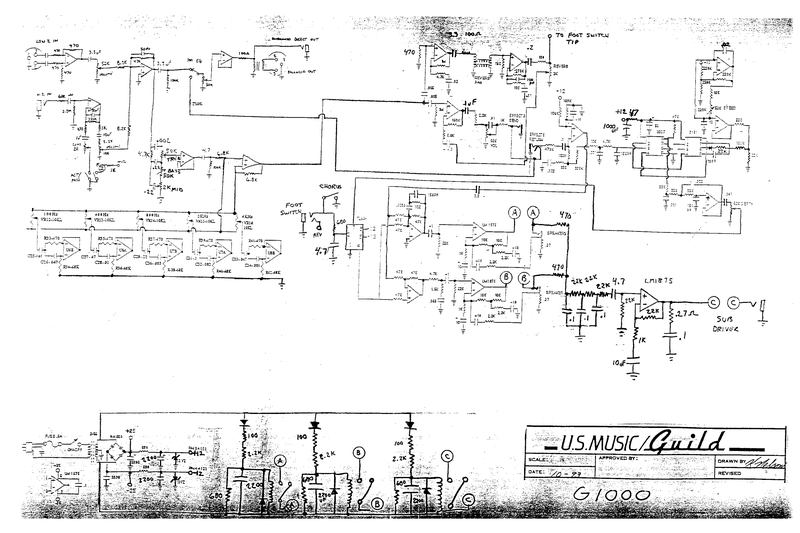 Looking at the schematics I did not see anything that jumped out at me, but I didn’t look at every component. Since these were all made in the early ’90s and the speakers are known to be no longer made, it’s very possible that this could be the case. If I discover any details that prove this to be true I’ll make sure to update this post. Note that the fuse on all of these amps is inside the amp chassis which means if the fuse is blown you’ll have to pull the entire thing to get to it. The sole exception to this may be the G1000 which appears to have a circuit breaker with a red reset button on the control panel near the power socket. Hopefully this info can help some people out in their quest for information about these fascinating amps. They’re pretty cool, sound damn good once you figure out how to dial them in, and look great in the process. The only advice I can give if purchasing one is to make sure that all of the functions work because historically they have been difficult to repair given the lack of information out there. If you’ve got any information that I’ve missed please do leave a comment or email me and I’ll include it here. If and when I manage to get my hands on any of these amps I will review them individually in much greater detail. My name is AJ. I acquired an Aspen G500 210 stereo chorus combo. 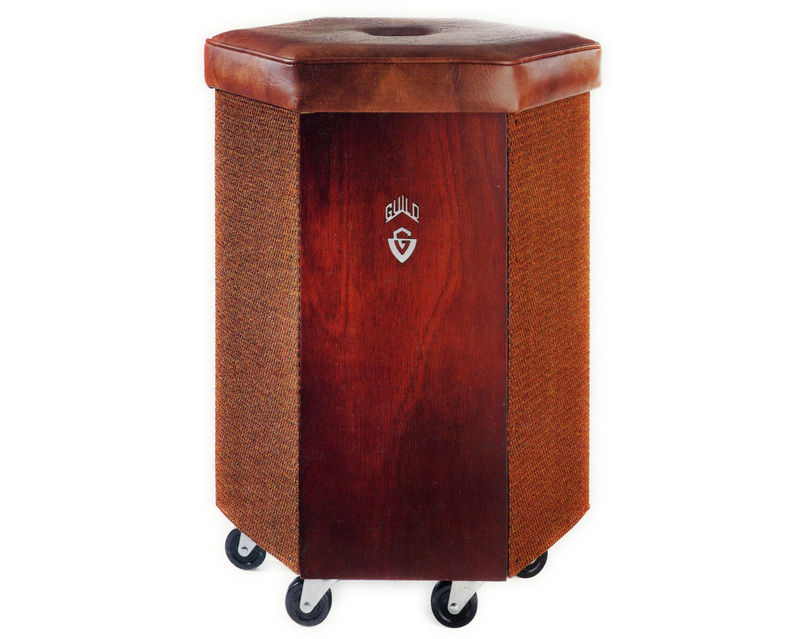 Is this combo with the brown tolex also made of solid oak? Thanks to the author and to Kevin N. For the info. Hey there! I’d love to see pics of your G500. You can email them to gad@gad.net if you’d like. The G500 in my possession does not have tolex, but the cabinet is the same solid oak as my other Timberline amps which leads me to believe that yours probably is as well. It’s hard to say for sure without a pic of an exposed end-piece from the cabinet, though. Thanks for all the info on these amps. I have a G700 Sequoia. It also has the red reset button that you mention on the G1000. I am really a bass player, but after stumbling upon a Hank III show in Austin a few years back I decided that I wanted to get into playing acoustic. I knew that Hank played a Guild, so I bought a late 90’s Acoustic/Electric Guild from a local guitar shop in Austin. 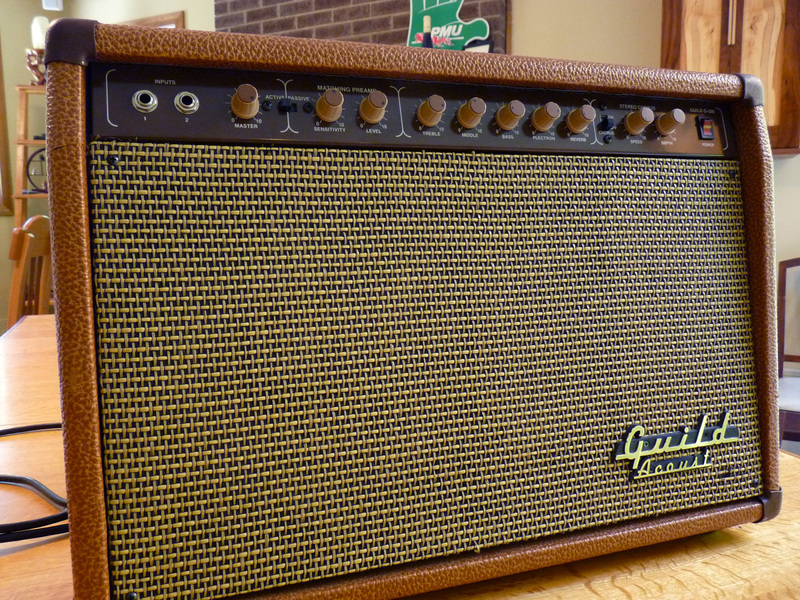 I needed an amp to go with my new investment, so I hit up craigslist and found a guy selling a Guild amp for $100. No pictures, not much of a description, it just said “Guild acoustic amp – $100.” I contacted the guy and gladly gave him $100 for the Guild G500. 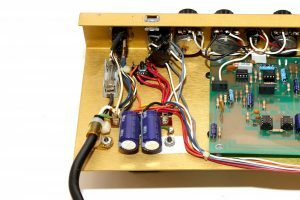 I have done quite a bit of research on Guild products in recent years and have found nothing on this amp until I came across this article! Thanks! I’d love to see pics of it. I have a G500 that I’ll be reviewing and I’ve only seen two or three others.